When I was a kid, I was sure that by the time I grew up there'd be robots everywhere, taking care of all the things I didn't want to do. They'd walk the dog, water the plants, attend my company holiday parties. Well, here I am in the future, a proper adult ... with nary a robot servant in sight. What gives? Turns out I'm living in the wrong country. 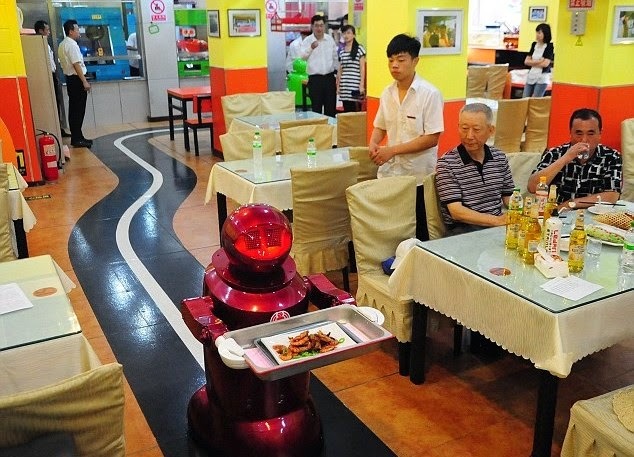 In Harbin, China, there's a restaurant called Haohai that's staffed by robots. Robots take your order, prepare your food, bring them to your table, even serenade you upon request. Next time I'm in China, I think I'll pop in and try to convince one of these guys to come do my laundry. Just don't tip too badly, or the robots will, of course, revolt. And then the robot apocalypse will be on you.